. The easiest way to improve your email open rates.
. The best place to begin cleaning up your online branding.
. How to get in front of a busy - and increasingly impatient - audience.
. How to create a memorable brand experience through social media.
. An easy-to-implement technique for gathering audience data. Today's digital marketing technology can help you engage thousands of prospects at a low cost - but only if you have the right strategy. 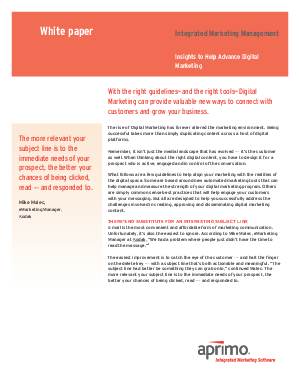 This white paper will help you overcome the challenges involved in launching successful digital campaigns.